Be the first to share your favorite memory, photo or story of Reverend Doctor Clarence . This memorial page is dedicated for family, friends and future generations to celebrate the life of their loved one. Reverend Doctor Clarence Crawford born in Manning, South Carolina. Resided in Morristown, NJ and later Baltimore, MD. Former Pastor of the Bethel AME Church in Morristown, NJ. Rev. 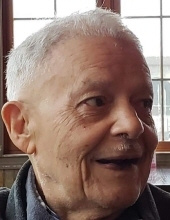 Dr. Clarence Crawford transitioned peacefully on March 11, 2019. He was born on May 18, 1927, in Manning South Carolina, to the late Clarence C. Crawford and Beulah O. Walker, both of whom predeceased him. He was their only child and was educated in the public school system. He pursued higher education and graduated from South Carolina State University, Orangeburg SC. Class of 1947 with a Bachelor of Arts Degree. While there he became a member of Omega Psi Phi fraternity. Rev. Dr. Crawford initially enrolled in Law School to become an attorney but decided to answer the call to ministry instead. He subsequently enrolled in Gammon Theological Seminary (ITC) in Atlanta Georgia, where he obtained a Master of Theology degree. Rev. Dr. Crawford began his ministerial career in the First Episcopal District of the African Methodist Episcopal Church. His initial pastoral appointments included St. Paul, Cambridge, Massachusetts; First Israel, Albany, NY; Bethel, Amityville, NY [now Copiague] and Bethel, Passaic, NJ. While serving as pastor of Bethel Passaic, Rev. Crawford met and married Lira Mae Paulhill on May 11, 1963 in Passaic, New Jersey. Their marriage was blessed with one son, Michael Crawford. In 1966, Rev. Dr. Crawford transferred from the New Jersey Annual Conference to the Bermuda Annual Conference as was appointed to St. Paul, Hamilton, Bermuda. In 1970, Rev. Crawford transferred from the Bermuda Annual Conference to the New York Annual Conference and was appointed to Bethel Tabernacle in Brooklyn, New York. After serving as pastor there for one year, he transferred to the New Jersey Annual Conference and was appointed to the newly constructed Bethel Church in Morristown, NJ. Rev. Dr. Crawford served Bethel Morristown with distinction. He was widely known for his erudite preaching style and powerful imagery. Members of Bethel often spoke of learning new words whenever he preached. His colleagues in the African American Clergy Council of Morris County regarded as a master proclaimer of the Word. On December 19, 1987, Rev. Dr. Crawford, along with Presiding Elder Bynum C. Burton and Bishop Frank Cummings, celebrated the mortgage burning for Bethel’s third sanctuary. Also, he obtained Doctor of Theology from Union Theological Seminary, New York, while serving in Morristown. In 1990, was appointed to the Mt. Pisgah AME Church in Jersey City, NJ. The following year his heart was broken, when his wife of twenty-eight years transitioned from labor to reward. He also served as Presiding Elder of the Camden Trenton District in the New Jersey Annual Conference and in the Philadelphia Annual Conference. Rev. Dr. Crawford is preceded in death by his beloved wife, Lira. He survived by their son, Michael Crawford and grandchildren Brittany Alexandra Crawford, Mervyn Dominc Crawford and Bernard Christopher Crawford. To send flowers or a remembrance gift to the family of Reverend Doctor Clarence Crawford, please visit our Tribute Store. "Email Address" would like to share the life celebration of Reverend Doctor Clarence Crawford. Click on the "link" to go to share a favorite memory or leave a condolence message for the family.